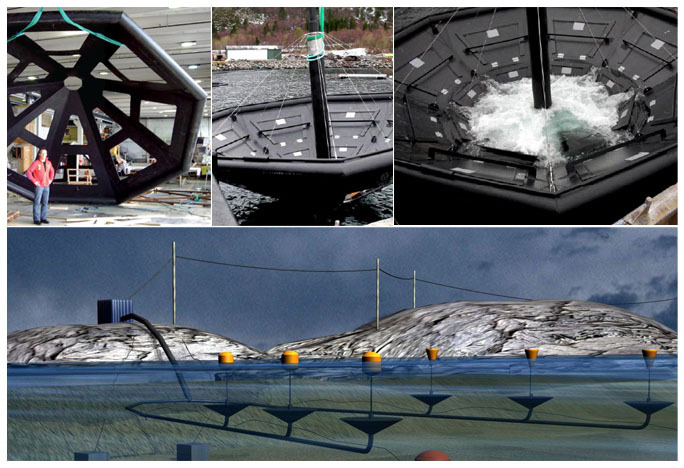 The original idea for the concept behind the technology was concieved by Dagfinn Røyset, former CEO of Pelagic Power. Røyset was the driving force behind the inital development of the concept. He also patented the working principle and the central components of the technology.Nord-Trøndelag Elektristetsverk FKF (NTE), a local utillity company was contacted at an early stage to strengthen the concept. During the spring of 2005 a strong project team was established, conisting of members from Lycro, NTE, The Norwegian University of Sience and Technology (NTNU) in Trondheim, Innovtive Development & Marketing AS and Leksvik Industriell Vekst two SMEs based outside Trondheim. 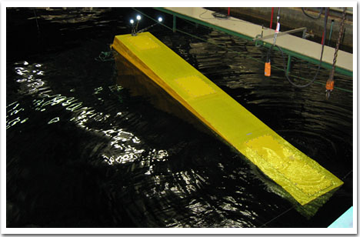 During the summer and fall of 2005 several small size prototypes was tested both at a local dock otuside Trondheim and at the test facilities of Sintef Marintek in Trondheim. The results from these tests was sufficiently positve for the project team to decide to move the project further. Above: Early testing at Marintek, Trondheim. In 2007-2008, the company launched a small-scale site, testing the technology under real weather conditions, in a marine environment. The research site was placed outside of Lauvsnes in the municipality of Flatanger in Nord-Trøndelag.